First off, let me say CONGRATULATIONS to you and your fiance on your engagement!!! And if you are reading this blog on behalf of a friend or family member who is recently engaged, thank you for helping them get started on their Wedding Planning Journey! So, this blog post is for any engaged couple ready to plan their big day! Whether you are paying for your wedding yourself, or your parents or family are footing the bill, the first thing you need is a BUDGET. You have to know how much money you have to work with before you can begin this process. So that's what this post is here to do; give a few helpful tips to get your wedding budget underway! Now, the budget doesn’t have to be intimidating; you just have to decide on a realistic amount of money that you (and/or your family) are willing to spend and STICK TO IT. Once you have that number, it’s just a prioritizing game from there. o Do you have that amount already saved up or will you be saving a certain amount every month during the course of your engagement? o Will they give you a check upfront for the total amount they are willing to spend? o Will they give you a certain amount incrementally over the course of your engagement? o Will they pay for a certain aspect of your wedding, i.e. your dress, or flowers, or catering, etc.? If you do not have your “DO NOT EXCEED” amount already saved up and you plan on saving a certain amount during the course of your engagement, keep in mind that you will have to pay deposits for almost all of your vendors. So make sure that you have enough funds already available to cover those deposits. Most families have the absolute best intentions, but sometimes, they can over commit when it comes to paying for a wedding. So make sure, if your families are not writing a check for their full commitment before you start writing checks to vendors that you stay on top of what money YOU PHYSICALLY HAVE. You don’t want to set your budget and rely on an “IDEAL CONTRIBUTION” and get down to a few months before the wedding and still not have those funds. That will surely put you in a bind and cause you to forfeit something you were expecting to have at your wedding if you can’t cover the difference. Going over budget is NOT an option. You can always increase your budget if you have the money to do so, but you don't want to start your new marriage off in a hole because you didn't properly manage your wedding expenses. (Stay tuned for my next post on how to have a Debt Free Wedding). So have those conversations with your fiance and families so you can get this party started! 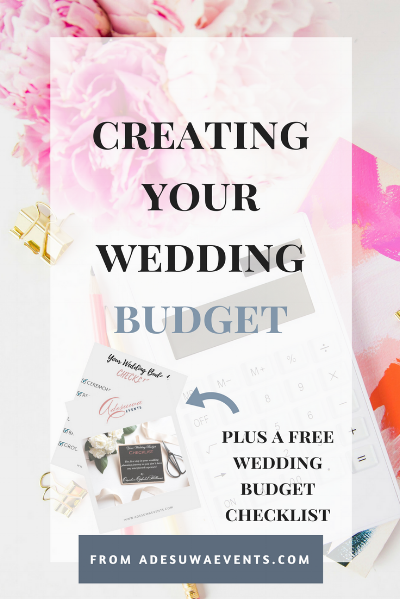 I hope this information is helpful and I wish you Happy Wedding Budgeting! TO GET A COMPLIMENTARY WEDDING BUDGET CHECKLIST TO GO ALONG WITH THESE TIPS, ENTER YOUR EMAIL ADDRESS BELOW AND YOU WILL BE ON YOUR WAY TO WEDDING BUDGET BLISS! Because most brides are really excited about choosing their vendors, I am giving you some advice on how to make your decisions. In this post, I will give you some tips on how best to choose your wedding photographer. Wedding websites have their purposes. It gives you the opportunity to share a little about your love story and provide valuable information to your family and friends about your wedding activities. If you decide to include a wedding website in your engagement journey, or you’re still on the fence about it, I want to give you a few tips and details you may want to include. Because most brides are really excited about choosing their vendors, I am giving you some advice on how to make your decisions. In this post, I will give you some tips on how best to choose your ceremony and reception venues. Use these tips to help narrow down your selections. Unfortunately, most of us have had to endure a friend or family member who was a complete nightmare to be around while she was planning her wedding. So, today I want to give you some real, practical advice for you to consider so you won’t be labeled a BRIDEZILLA.